I threw myself into this handsome cookbook after getting back from Africa last summer because the food in Africa, contrary to my expectations, was so spicy, so hearty, so novel, so thoroughly delicious. I wanted to explore further. The food from The Soul of a New Cuisine was not quite so delicious. I cooked 18 of Marcus Samuelsson's recipes. I flipped through the book just now and wondered why I didn't try more, because a lot of these dishes -- ginger banana salad, trout spaghetti -- look very, very enticing. Or is that just because I haven't had lunch? Then I read the comments I scrawled next to a handful of the recipes I actually did cook and remembered why I gave up on the book. After a few disappointments -- like a crushingly expensive rack of lamb with an off-flavored spice crust -- I lost faith. The recipes didn't work as well as they should have; the results were not always delectable. One cake failed completely; so did the injera. The best dishes were the rustic, stewy preparations, like a delicious pot of mashed vegetables flavored with spiced butter. Wonderful, too, was Samuelsson's lamb curry. 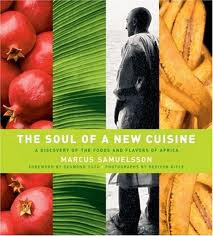 Less successful were the dishes in which Samuelsson tried to fuse his high-end chef's sensibility with African flavors. I'm thinking about that Berbere-crusted rack of lamb again. It's hard to forgive a recipe that ruins a rack of lamb. Not a terrible book. Not a shelf essential. So this African food is different from the African food in Moro? Tipsy: Glad to see the earnestness with which you are catching up on the earnest summations--I always enjoy them. And while I relish the stories (always funny and very well written) from your travel and other family adventures, really I come to your website for the cookbooks. Keep up the good work! Ginny -- I had to look up Tyson Cole. Will you write about, I hope? I need to tell you the Ko story sometime. I was going to post about it, but I was too furious. Beckster -- Moro was Spanish and North African. This book had some North African recipes, but was focused more on southern and central Africa. Melvil -- Thanks. One reason I got lazy about the summations was no one seemed to read them, and no one ever commented.